Leslie Jones, GR’18, on the intersection of Black feminism and social media. Leslie Jones, GR’19, was an early tech-native who can’t recall when she was not fascinated by social media and the web. She calls herself a “dyed-in-the-wool internet geek” who had daily internet access and used social media (as it existed in the early 2000s) from the age of twelve. She had a Geocities webpage, dabbled in HTML and CSS, and was comforted by the soothing sound of the AOL dial-up. Jones was thrilled (and surprised) to learn in her undergraduate years that she could study the web and social media academically. 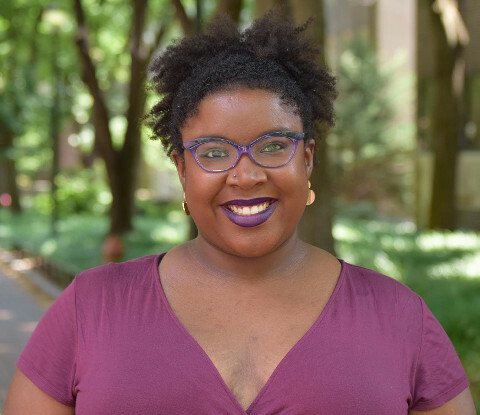 Today, as a Ph.D. candidate in the Department of Sociology and a Price Mellon Doctoral Fellow in the Price Lab for Digital Humanities, Jones is exploring the intellectual contributions of Black feminists on Facebook and Twitter. Jones became interested in the intersection of race, gender, and social media early in her graduate career at Penn when she wrote a case study about a website called PeopleofWalmart.com (the paper is currently under review for publication) that puts a spotlight on Internet trolling and harassment. In her dissertation, Jones uses the concept of the “salon” to create an intellectual genealogy of the different spaces where knowledge has been created. In early 18th-century France, a salon was a gathering of prominent intellectuals, writers, and artists at the home of a society host, usually a woman. Recent Black feminist scholarship has described the beauty salon (launched in the American Jim Crow-era) as a community-based epicenter for Black females to gather, discuss politics, and initiate social activism. Jones’ research focuses on a newer type of intellectual gathering place for women, specifically Black feminist women: Facebook and Twitter. Through her work, Jones gives a nod to the female-led French salon movement, but disentangles from the elite nature of the European salon. Jones is interested in the voices of everyday Black women and emphasizes that she is not focused on the social media platforms of academics. Although her dissertation is grounded in black feminist theory, critical race theory, and racial formation in sociology, she is specifically interested in Black feminist women who use social media as a “public platform for social critique about race and gender who are unaffiliated with a university and unaffiliated with institutions that have a legitimizing presence in the U.S. consciousness.” She is particularly concerned with Black women who are marginalized in the general sense, but also marginalized within the corridors of intellectual production, often located within the “ivory tower” of academia. She says these newer types of intellectual gatherings, therefore, may be less like a salon and more like a “marketplace of ideas” that builds upon the subversive nature of beauty shop politics. @FeministaJones has approximately 151,000 Twitter followers, and influencers like her are convening conversations on topics such as black girlhood’s mutual construction by and influence on the education system, domestic abuse in the NFL, sexual assault, and state surveillance—all intellectual contributions that Jones says the field of sociology ignores at its peril. Jones is slated to complete her Ph.D. in 2018 and is seeking a post-doctoral placement. She hopes to continue her work on social media and conduct a study on technological surveillance innovations. Penn Arts and Sciences graduate students present on myriad topics in TED Talks fashion. Researchers across Penn Arts and Sciences are learning from and in Philadelphia. Shortly after Jana Korn, C’18, arrived in Santiago, Chile, for a semester abroad, she learned to navigate Santiago’s heavily used public transportation system.